This file can then be moved to another PC and be dumped back. It is good if you can delete all unwanted files from the source partition that you would not need like .tmp files residing in C:\Temp or C:\Windows\Temp, Temporary Internet Files, cookies, do*censored*ents you don?t need anymore from C:\My Do*censored*ents (or wherever you normally save if it?s in C:\). You get the idea?right? In this example, I will show you how to dump an image (which is the whole drive?s file) into another partition. I will also show you how to break down each file so each file is smaller enabling you to burn them onto CDs or CDRW and thus saving HDD space. The example has a 40Gb HDD with 2 partitions created C:\ and D:\ each is 20Gb in size. You will need 2 things. A startup diskette (or you can access to DOS by selecting Start > Shut Down > Restart in MS DOS mode, or pressing F8 before the Windows boot up screen and choose Start Computer in DOS Mode. Boot up your system using the startup diskette, or any ways described above, just go to DOS Mode. NOT MS DOS prompt but pure DOS. 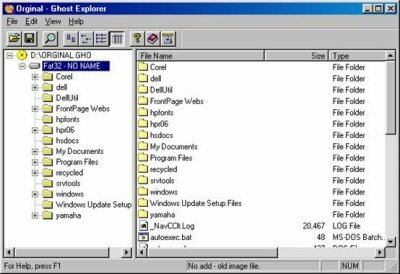 Once at the prompt, insert the other diskette that contains the ghostpe.exe file. We?ll be dumping from C:\ to D:\ so we choose using the arrow keys Local > Partition > To Image. Hit Enter. Ghost will show you the HDD you have install on your system, our system has 1 HDD partitioned into 2 drives. So only 1 HDD is displayed. The HDD is highlighted by default. Just Hit Enter. After Hitting in the previous step, Ghost will start to analysis the HDD, and it will show you the following screen. It has detected 2 partition on my HDD. Part 1 is C:\ and Part 2 of course is D:\. Notice that Part 2 aka D:\ has 2270Mb of data while Part 1 aka C:\ has only 1785, haha, that?s because there?s already a ghost image there taking up all that space. Ignore that, its nothing. Hit Enter to choose Part 1 as the Source partition. Tab to OK and Hit enter again. Remember: An image cannot be dumped into the same partition or drive the paritition or drive is going to be dump from. Meaning, you cannot dump C:\ into C:\ or D:\ into D:\. It?s quite logical actually. After keying in the name of the image to be created just hit enter again. Next, Compression. We choose High to make the image as small as possible but with the image compression set to high, later dumping it back will take a longer time, but no worries. That?s the setting I always use so as to save HDD space. To image and so on. Here you can see ghost running and working hard to dump you whole C:\ into D:\ with high compression. The PC I am working on has about 2Gb of data in C:\ (see next screen shot) and it?s just going to take me around 15 minutes to dump everything onto a single file. After the dump is complete, Ghost will prompt it is Successful. Hit OK (well, that?s the only button you can click on). Choose Quit. Then Ctrl-Alt-Del to restart your PC, remember to remove the diskette from the drive. Now see, a .gho file is created in D:\ and it?s only 0.99Gb less than a Gb. With all my C\ in it. If my PC crashes as I upgraded some drivers, all I have to do is dump the file back. And that brings us to the next section. Hit Enter again. This is the source partition. Hit Enter yet again. This is the destination drive. See the pattern here? You are doing it backwards now. When you dump an image, you select the local drive, then the partition and lastly specify the file name to dump to. Now you?re specifying the filename to dump from, local partition then local drive. Enter yet again as we?re dumping from Part 2 aka D:\ to C:\ aka part 1, Part 2 is blank out, we cannot select it. Remember? You cannot dump an image form C:\ to C:\ and vice versa, you cannot dump an image from C:\ to C:\ and of course not from D:\ to D:\ too. Tab once to select Yes and Ghost will proceed with the dump. Once completed, Ghost will prompt you again that it is successful. Hit Enter to restart and your PC should be back to the way it was. The way it was since the last time you dump the image to drive D:\. So if you dump (or you can treat it as a backup) your C:\ once a week, you will still have all the files create a week ago but not this week. So? You will have to backup all do*censored*ents, wallpapers you have downloaded this week before you dump the image file back as all will be gone! One more thing to add. If you have a new HDD that you bought, you need to dump it with the image file you just created, you won?t need to format it (unless you want to create partitions using FDISK), you can just dump straight away. It?ll work. Problem ? 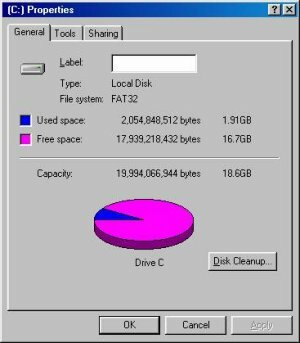 The file dump (rssitzone.gho) is too big to fit into any CD-R I have. I ain?t got a DVD-RW drive! So what do we do not? Don?t worry, Ghost can split the image files into small chunks and it?s file size is control by you. Now isn?t that a life saver? Here?s how you do it. Same steps, start PC in DOS, but here?s how you start ghost. 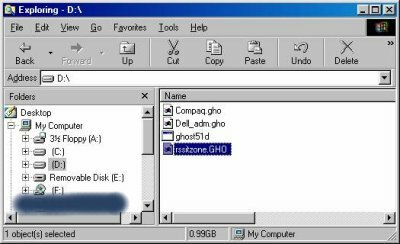 rssitzone.gho is 650Mb in size! Get it now? When I dump without the parameters, one single huge file was created that was around 0.99Gb in size. Now the file is splitted, one is 650Mb in size and the other is the remainder. I can now burn these 2 files on a CD-R each. The ?split=650 parameter tells ghost to dump each file to a size of 650Mb and if there?s more to dump create a new file with the extension set to auto (and thus the ?auto parameter) the second file will be .001, third is .002 and so on. Now wasn?t that simple! OK, time for a break, that was one long HOW-TO. Look out for another edition of Ghost where I?ll show you how to do network cloning. You can view that is in a .gho file by using the Ghost Explorer that comes with the Ghosts software. Start it and you will see the following Warning, actually it?s more of a information? Here, you will see what?s in the ghost image in a Explorer kind of view, you can delete files or add files from and from it, provided you use the version required to do so, read the previous warning.. That?s it on Ghost Explorer.